In this application note, we study how accurately the DelsaMax CORE instrument can determine the molecular weight of monoclonal antibodies and common proteins. Accurate determination of the molecular weight of proteins and antibodies is typically very inaccurate and time-consuming; gel electrophoresis, the most popular method, requires calibration standards, is semi-qualitative, lacks sensitivity, and has numerous sources of error. By using the simultaneous Dynamic Light Scattering (DLS)/Static Light Scattering (SLS) system of the DelsaMax CORE, molecular weight measurements can be performed in just a few seconds at a wide range of concentrations and temperatures. The results demonstrate the extremely high accuracy and speed of the DelsaMax CORE for molecular weight determinations; while proteins and antibodies act as an example system, the molecular weight can be found for any biological molecule, polymer, or particle ranging from 300 Da up to 106 Da in molecular weight. The ability to obtain the molecular weight of molecular systems will be very valuable for molecular biologists looking at protein-protein interactions and antibody-antigen interactions. Accurate determination of protein and antibody molecular weight has great importance in the field of molecular biology. Antibody self-association interaction, protein stability, and antibody-antigen interaction are all processes that can be studied by analytically determining the molecular weight of the system1,2. The most popular method for determining protein molecular weight—gel electrophoresis—is plagued by a number of issues; most importantly, the gel electrophoresis method is not a direct measurement,but requires calibration standards with every test3. Direct measurement of antibody and protein molecular weight can be done using analytical ultracentrifugation and mass spectrometry among other methods4. The most rapid, low-volume method of direct protein molecular weight measurement, however, is combined SLS and DLS. Simultaneous SLS and DLS has enjoyed increasing popularity over the past decade as the technology has matured, because it requires volumes as low as 1 microliter and molecular weights can be accurately determined in a few seconds, without loss of sample. As ensemble techniques, SLS and DLS are statistically significant. The ability to measure proteins in buffer without dilution or destruction of sample is even more important, especially when working with precious monoclonal antibody samples. Monoclonal antibodies (MAbs) with IgG structure are between 150 to 160 kDa in molecular weight. The structure of the antibody includes two identical heavy chain fragments and two identical light chain fragments, which are connected with disulfide linkages. The antigen-binding regions of an antibody are the two Fab fragments, each ~45 kDa. The region of the antibody with no antigen-binding activity is the Fc fragment, ~50 kDa in weight5. At higher concentrations, some species of MAbs exhibit aggregation into dimers or higher molecular weight structures. 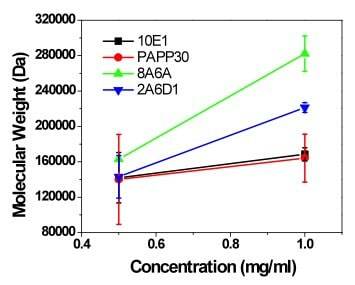 In this application note, we probed the aggregation of four mouse MAbs using the DelsaMax CORE instrument with simultaneous SLS and DLS by examining their molecular weight at 0.5 mg/mL and 1 mg/mL; an increase in molecular weight above 160 kDa at 1 mg/mL clearly demonstrates aggregation behaviour for two of the antibodies. The MAbs in this application note are all specific for Pregnancy-Associated Plasma Protein A (PAPP-A), which was first discovered in the serum of pregnant women. Two different forms of PAPP-A have been discovered—heterotetrameric PAPP-A (htPAPP-A) and homodimeric PAPP-A (dPAPP-A). A significant decrease in htPAPP-A in the first trimester of pregnancy is a marker for Down Syndrome, while studies have indicated that dPAPP-A levels are increased in patients with acute myocardial infarction6. Thus, understanding the aggregation behaviour of the MAbs used in diagnostic assays for PAPP-A is extremely important. This application note additionally highlights the accuracy of protein molecular weight detection on the DelsaMax CORE by accurately analysing Bovine Serum Albumin (BSA), a well-characterised protein. This characterisation was carried out over a temperature ramp from physiological temperature up to nearly 90° C; above 62° C, obvious aggregation of the BSA was observed both by an increase in molecular weight and an increase in average protein diameter. BSA is widely used as a model protein because it is readily available and the physical proper ties (size, amino acid sequence, molecular weight) are well established. BSA has a wide range of biomedical applications, including that of a protein-blocking agent in ELISA tests. BSA (Sigma Aldrich) was dissolved in 1x Phosphate Buffer Saline (137 mM NaCl, 2.7 mM KCl, 10 mM Na2HPO4, and 1.8 mM KH2PO4) at a concentration of 2 mg/mL; brief bath sonication was applied before use. BSA was filtered through a 0.1 micron filter (Whatman); 50 μl of filtered BSA was pipetted into a previously calibrated DelsaMax CORE quartz cuvette, which was immediately capped and placed in the DelsaMax CORE. The quartz cuvette had been calibrated with toluene at 20° C; additional calibration of the PBS solvent at 20° C and 90° C was necessary as well, in order to make SLS-based molecular weight measurements (MW-S). Knowledge of the sample dn/dc value—typically .185 mL/g for proteins—is required, and knowledge of the second virial coefficient (A2) helps to improve accuracy (0.00014 mol * L/cm for BSA). An event schedule was programmed to allow the BSA and cuvette to initially come to temperature equilibrium at 37° C followed by molecular weight measurements using the combined SLS and DLS. After the measurement, the temperature incrementally rose by 5° C, followed by a molecular weight measurement; this process continued until the temperature reached 82° C.
Four mouse MAbs samples were also used for molecular weight analysis at both 0.5 mg/mL and 1 mg/mL concentrations. The four MAbs were 2A6D1 – IgG1к and 8A6A – IgG1к (Beckman Coulter) and 10E1 – IgG2b, PAPP30 – IgG1 (HyTest). All four are PAPP-A specific monoclonal antibodies. The MAbs initially were at a concentration of 1 mg/mL in 1x PBS and 0.1% Sodium Azide; dilution with 0.02 micron filtered 1x PBS was done to reach 0.5 mg/mL. 20 μl of each monoclonal antibody was pipetted into a previously calibrated quartz cuvette, which was then capped and placed in the DelsaMax CORE. Because of the limited amount of each antibody, the samples were not filtered before placement into the cuvette, which introduced a degree of variability into the data. The size and molecular weight of the MAbs were measured at 25° C.
DelsaMax CORE measurement parameters for both BSA and antibody were five seconds of acquisitions with three acquisitions per measurement. For BSA measurements, the quartz cuvette was calibrated with PBS at 25° C and 90° C. For the mouse MAbs measurements, the quartz cuvette was calibrated with PBS at 25° C.
BSA had accurate diameter measurements with an experimental value of 7.46 + 0.07 nm at 37° C, compared with a theoretical prediction of the Stokes’ radius of ~ 7 nm—a difference of less than 0.4 nm. The molecular weight was even more highly accurate, with an experimental molecular weight of 67.48 + 0.01 kDa compared with the theoretical value of the mature BSA protein of 66.5 kDa. 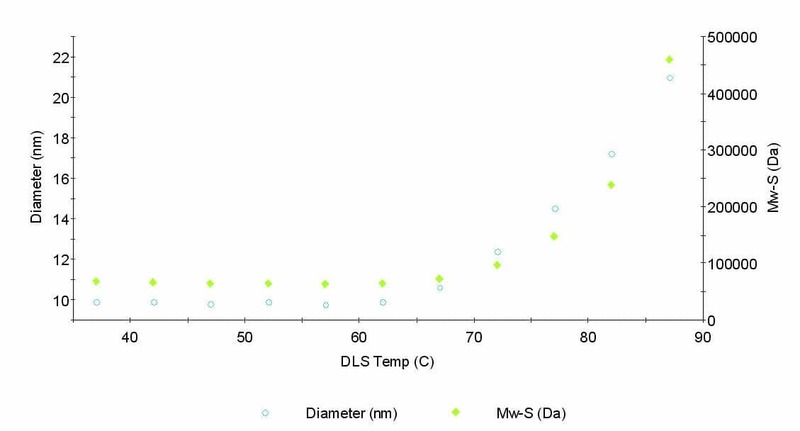 The temperature ramp studied also readily demonstrated that both diameter and molecular weight track with the denaturation and aggregation of BSA at higher temperatures (Figure 1). While the BSA remained stable for a few minutes at 62° C, aggregation began to be observed; the aggregates continued to increase in size as the temperature increased to 87° C. The event schedule specified that the temperature increment by 5° C after each measurement with a ramp rate of 5° C/minute. Measurements were only made when the temperature plateaued at the set temperature, taking typically three to four minutes between measurements. The mouse MAbs were measured between 140–163 kDa for all four samples at 0.5 mg/mL. The accuracy for the mouse MAbs is slightly reduced because the samples could not be filtered; only a minute amount of each antibody was available. However, since most IgG antibodies are between 150 to 160 kDa in molecular weight, all tested mouse MAbs had reasonably high accuracy. At a higher concentration of 1 mg/mL, 10E1 and PAPP30 both had molecular weights between 160 to 170 kDa, indicating that these antibodies remained as monomers. In contrast, 2A6D1 and 8A6A both had apparent molecular weight increases at 1 mg/mL concentration; dimer formation of both at higher concentrations is the suspected cause. Overall, the DelsaMax CORE system performed admirably in analysing low concentration protein and antibody samples. At 0.5 mg/mL, the mouse monoclonal antibodies scattered just slightly more light than the background buffer solvent, and the DelsaMax software was still able to measure the molecular weights in less than 20 seconds. At higher (but still relatively low) concentrations of BSA protein, molecular weight measurements were made over a large range of temperatures with excellent accuracy while tracking the aggregation of the protein at temperatures above 70° C.
Figure 1. Bovine Serum Albumin Temperature Ramp. BSA hydrodynamic diameter is potted along left y-axis while the molecular weight is plotted along the right y-axis. Note the excellent agreement between diameter and molecular weight. Table 1. Experimentally Determined Strokes’ Radius of the Mouse Monoclonal Antibodies. Figure 2. Molecular Weight – based on Simultaneous Static Light Scattering and Dynamic Light Scattering measurements – for the Four Mouse Monoclonal Antibodies. Note that 8A6A and 2A6D1 appear to have some degree of formation of dimer species as a concentration of 1mg/mL. 1. Molina-Bolivar J A, Galisteo-Gonzalez F, and Hidalgo-Alvarez R. Fractal aggregates induced by antigen-antibody interaction. Langmuir. 17.8; 2514–2520: (2001). 2. Sule S V et al. High-throughput analysis of concentration-dependent antibody self-association. Biophysical journal. 101.7; 1749: (2011). 3. Rath A et al. Detergent binding explains anomalous SDS-PAGE migrationof membrane proteins. Proceedings of the National Academy of Sciences. 106.6; 1760–1765: (2009). 4. Lebowitz J, Lewis M S, and Schuck P. Modern analytical ultracentrifugation in protein science: a tutorial review. Protein Science. 11.9; 2067–2079: (2002). 5. Kindt T J and Kuby J. Kuby immunology. Macmillan, 2007. 6. Heeschen C et al. Pregnancy-associated plasma protein-A levels in patients with acute coronary syndromes comparison with markers of systemic inflammation, platelet activation, and myocardial necrosis. Journal of the American College of Cardiology. 45.2; 229–237: (2005).